Project cars and adventuring are costly hobbies that require planning and taking time off. I can’t always work on the cars, hitting up trails with friends or spending the weekend camping, nor does my wife approve of me amassing multiple cars. While I’ve spent many hours discussing obscure cars I’d love to own or projects that would be cool with Andy, my salary can’t quite keep up with my perverse vehicular dreams and fantasies. I found a different rabbit hole that satisfies my need to tinker and love for cars, but on a smaller scale at a slightly cheaper cost (LOL not really). RC, two little letters that bring back fond childhood memories, but on an adult level. See, the RC cars I had in my younger days—the Tyco, Nikko’s and New Bright—are child’s play. They were fun but built as disposable toys. I discovered RC crawlers about two years ago. 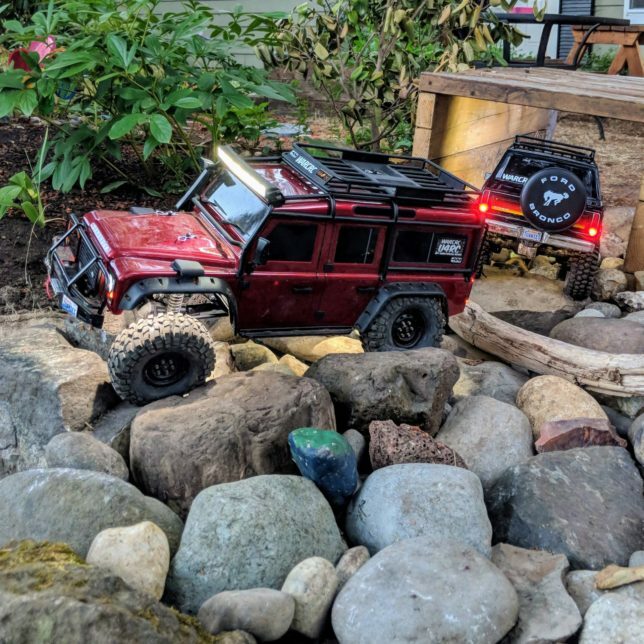 What started out as a single Axial SCX10 with a body that resembled a Jeep Wrangler that I could bring to play with at parks evolved into a complete fleet of off-road RC cars for every occasion—slow and steady rock crawling, trailing, bashing, short-course and even indoor crawlers. It’s an addiction that I have zero desire to seek help for. My last two crawler additions were my two Traxxas TRX-4s. 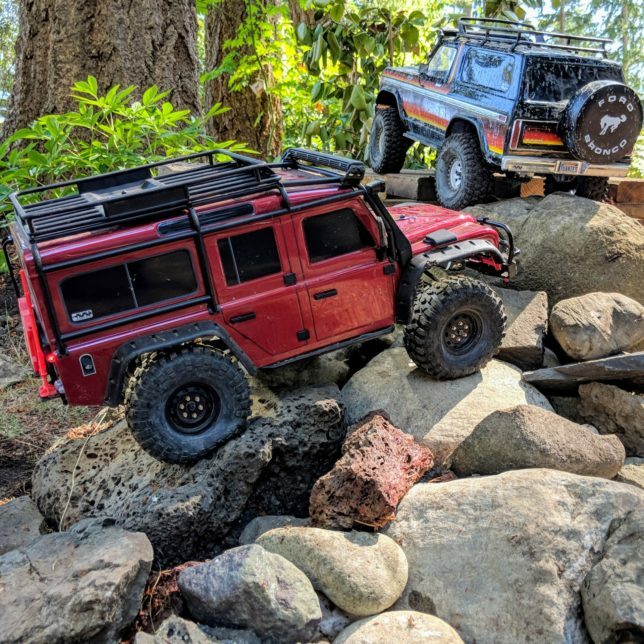 I fell in love with Traxxas’ first attempt at a rock crawler with its locking front and rear differentials, two-speed transmission, and gorgeous Land Rover Defender 110 body. I’m a sucker for details, like the plastic exo cage, spare tire, jack, Rotopax cans, and light buckets, so I picked one up in October 2017. Then Traxxas revealed a ’79 Ford Bronco with the Free Wheelin’ sticker package at SEMA 2017 and I fell for that one too. However, the official sell date wasn’t until March, in time for my birthday so I bought one too. As with my actual vehicles, the little 1:10 scale RC crawlers didn’t stay stock for long. 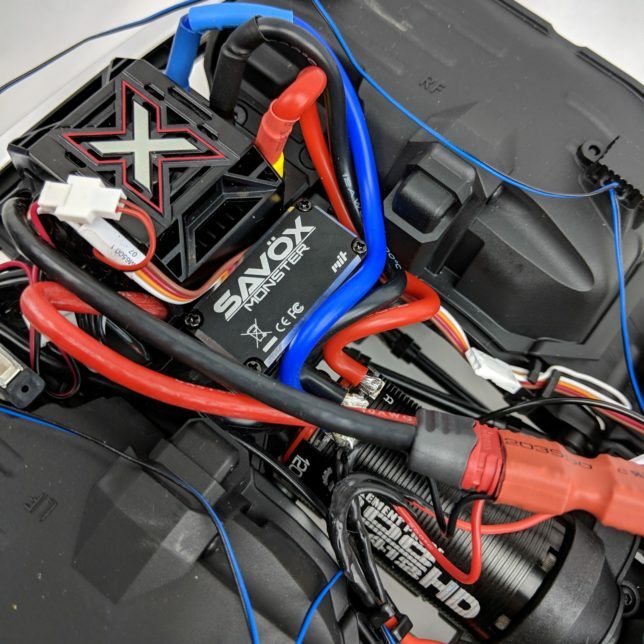 The stock brushless motor and electronic speed controller (ESC) were immediately ripped out and replaced with a Castle Creations ESC and matching sensored brushless motor, as were the steering servos, wheels and tires. I honestly ran the stock electronics for all 2 minutes to verify it worked before upgrading. Both vehicles received different upgrade treatments. I wanted the Defender 110 built for trailing and started with a 1900KV (higher KV = higher top speed, lower KV = more low end torque) 540-size motor. Eventually I fried that motor (it took a lot of abuse) and swapped in a 1900KV Tekin Racing ROC 412 HD 550-size motor. Powering the Defender 110 is a 4S (4-cell) lithium-polymer (lipo) battery when typical crawlers run on 2S and 3S batteries. This gave me plenty of low end grunt without the top speed of higher KV motors and fits the personality of a torquey diesel motor. 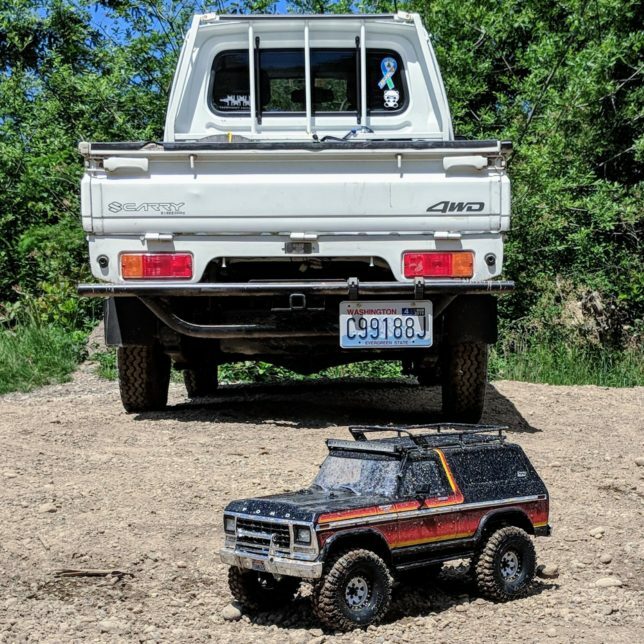 I wanted the Bronco to have a powertrain that suited the malaise nature of the real vehicle and installed a similar Tekin Racing ROC 412 HD, but with a torquier 1200K motor and power it with a 6S lipo so it could power through any obstacle with the immense amount of torque. The two vehicles received high torque Savox steering servos and MyTrick RC light kits for a more realistic look. I even installed a programmable sound module in the Bronco with a Ford V8 engine sound loaded for that extra touch of realism. Building and upgrading the crawlers is only half the fun—the other half is taking them out. I’ve taken them out on hikes and parks with my wife and kids. Anywhere that has rocks, gravel, sand or grass is a play area. The local hobby shop—Remote Control Hobbies—in Covington, WA. 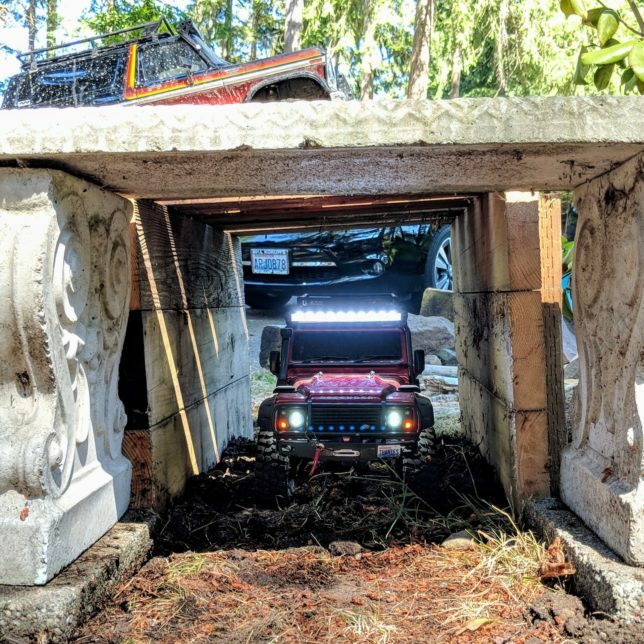 even has a sweet rock crawling and race course out back. I briefly participated in U4RC racing during the 2017 season and even took 3rd place in my class with my old Axial SCX10 II but haven’t gone very often this year since it always falls on the same Saturday as Cars & Coffee at Griots Garage. We had a couple snow days this year and spent weekends in Packwood and Leavenworth, WA. 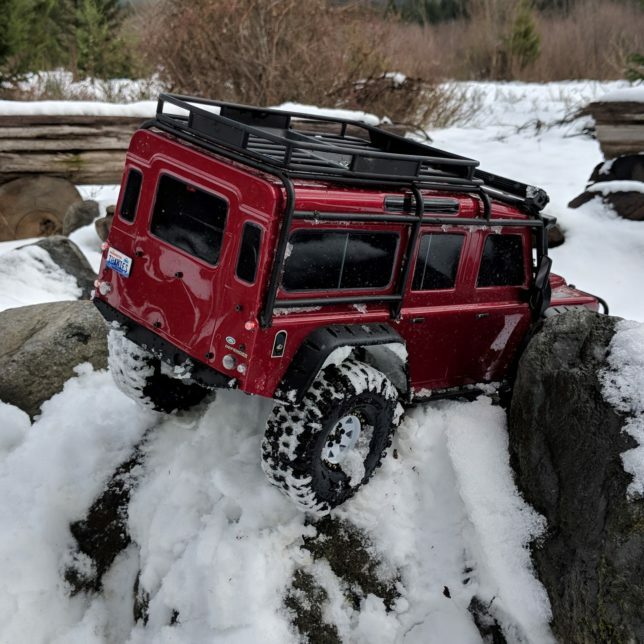 Playing in snow with the RC crawlers is a ton of fun. I even tied a sled to it and pulled my daughters around on a flat icey surface. ﻿ Unfortunately, 2018 has been a busy year overall for me on the work side of things. I haven’t had as much time to go out to the park or make it to the hobby shop, but my wonderful wife approved of my idea of building my own play area in our yard. Our house had a lot of random rocks scattered around the house from the previous owner’s landscaping choices. There were plenty of large rocks to put a course together. My wife agreed to let me build the course in our front yard next to the driveway where grass didn’t grow. My wife started the course by putting larger rocks she found while landscaping and moved them to the designated area. I wasn’t content with only having rocks to crawl over and got a little creative with spare wood from our former patio. It started with a single idea—I wanted a tunnel, so I built a simple rectangular box and lined the floor of it with rocks. Then I remembered the log crossing from NWAPA Mudfest and buried a couple logs made from a branch that fell on my kid’s 12V ride-on toy. Then came a water crossing I could fill up with water that would self-drain. I dug a trench and lined it with part of a free Harbor Freight tarp I cut up and covered with rocks. 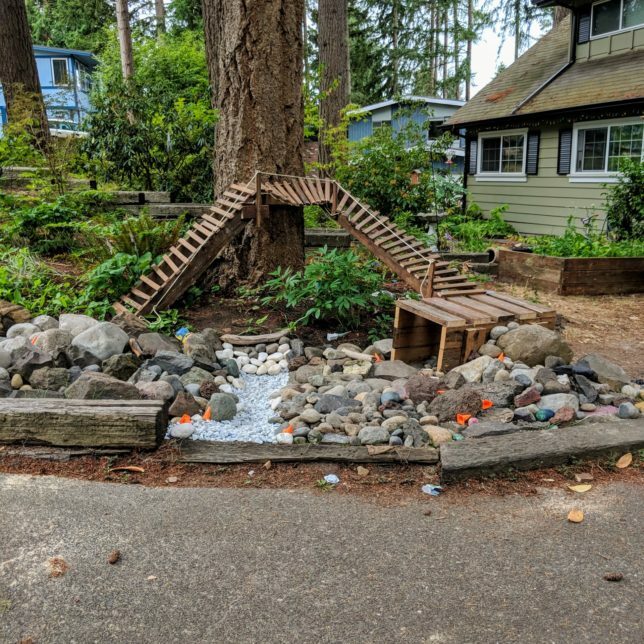 Lastly, I’ve always wanted a sketchy bridge, so I built it without any formal plans or measurements—I eyeballed the cuts and nailed the boards to give it that extra sketchy look. If this all sounds fun to you, I urge you to take up the hobby. Its not cheap, but more cost effective than an actual car, plus you don’t have to drive it home later. The cost of entry varies depending on what you want, but you can pick up a rig and batteries for around $300. It only goes up from there. The upgrades are part of the fun, but a lot of time unnecessary. I could’ve run it stock and replaced parts with upgrades as it broke, but I enjoy building and tinkering. 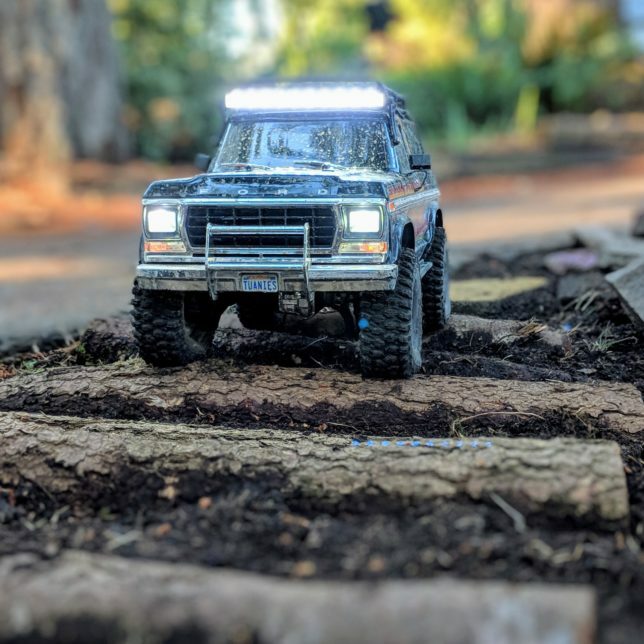 Now if you’re into trailing and off-roading with actual cars, RC cars make a great companion for that too. 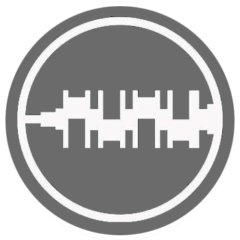 The RCCrawler Forums is an excellent resource for RC crawlers and filled with knowledgeable people and a robust archive of guides. There’re plenty of Facebook groups, too. As for where to shop for RC parts, I recommend supporting your local hobby shop if you can, but I do most of my shopping online with Amain Hobbies. Horizon Hobby and RPP Hobby are other reputable sites to order from.